CarGurus has 42,259 nationwide Acadia listings starting at $3,500. The 2012 GMC Acadia crossover vehicle carries up to 8 passengers in its well-equipped cabin and achieves a good balance between SUV and sedan, with the right mix of styling, versatility, functionality and value for families. The 2012 Acadia's hefty weight can make it cumbersome to drive at times, and some owners have reported minor build-quality problems with the vehicle. 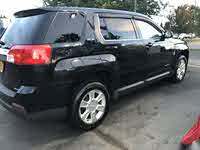 Anyone in the market for a spacious and stable family car should take a look at the 2012 GMC Acadia. Although the upscale Denali trim may not be worth the price, the Acadia's reasonably comfortable third-row seat, cavernous storage and reputation as a Top Safety Pick make it a good alternative to the typical family minivan. 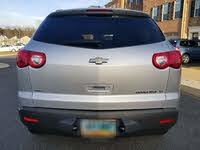 GMC made only a few updates to the GMC Acadia crossover vehicle for 2012. The trim lineup, consisting of the SL, SLE, SLT1, SLT2 and upscale Denali, remains the same, and the powertrain rolls over unchanged as well. Foglights and two new paint colors, Crystal Red Tintcoat and Stone Gray Metallic, are among the few new exterior changes for all trims, while body-colored side moldings are now standard for all but the base SL trim. The SLT trims and the Denali, which debuted just last year, also now include outside mirrors with integrated spotters for blind spots. Other new features for all trims include an accessory power outlet in the center console. Entering its fifth year of production, the Acadia shares a platform with the Buick Enclave and Chevy Traverse, and seats up to 8 passengers in 3 rows. It comes standard with front-wheel drive (FWD), although GMC offers intelligent all-wheel drive (AWD) at all trim levels. Competitors include the Buick Enclave, Kia Sorrento, Mazda CX-9, Toyota Highlander and Honda Pilot. Despite its SUV-like appearance, especially from the front end, the Acadia sits relatively low to the ground, making it easier for passengers to enter and exit the vehicle. GMC notes a front-door step-in height of just 18.9 inches, and a rear-door step-in height of 19.8 inches. Outside, a sculpted hood, nicely rounded edges, flared wheel wells, a black mesh grille and a sporty stance give the Acadia a sleek rather than boxy look. Chrome accents, jeweled headlights, LED taillights and dual chrome exhaust tips add a sophisticated touch. At the same time, the Acadia's design remains functional. For instance, wide rear doors, as well as GM's Smart Slide feature for the second row, make it easy for passengers to get to the rear seats. Exterior options include a power liftgate and a dual Skyscape sunroof. In addition, the Denali trim displays a number of unique exterior design features, including a chrome honeycomb grille, trim-specific front and rear fascias, and body-color lower cladding and rocker moldings. Power for all Acadia trims continues to come from a 3.6-liter DOHC V6 with direct injection and variable valve timing. Working with a Hydra-Matic 6-speed automatic transmission designed to improve efficiency and fuel economy, the V8 puts out 288 hp and 270 lb-ft of torque while managing fuel economy numbers of 17/24 mpg for FWD trims. That drops slightly to 16/23 for AWD trims. The optional AWD system improves traction by automatically shifting torque between the front and rear wheels based on wheel speed, throttle and road surface conditions. Reviewers note that while it does it good job on paved roads, the AWD system is not designed for serious off-roading. Properly equipped, the Acadia has a maximum towing capacity of 5,200 pounds. The Acadia's rather hefty curb weight of 4,720 pounds (4,925 for AWD trims) can make it feel cumbersome at times, and the optional AWD system, which increases the vehicle's weight, enhances that feel. 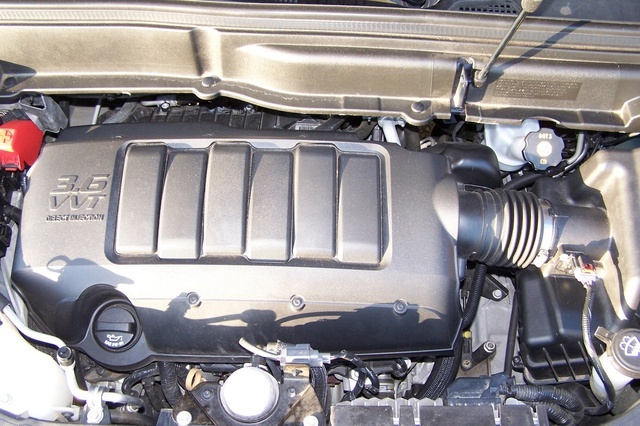 However, there are few complaints about the engine’s ability to move the vehicle along quickly and smoothly. In addition, the Acadia's low ride height gives it a lower center of gravity, which helps improve agility, yet the driver still sits relatively high, improving visibility out the front. In addition, GMC tunes the suspension for a more car-like feel, and testers and owners agree that the Acadia delivers a smooth, stable ride. The suspension does a good job of handling road imperfections, delivering minimal discomfort to the cabin, and body lean is nicely controlled in tight corners. The Acadia rides on a 118.9-inch wheelbase, with an overall length of 200.7 inches. Independent front and rear suspensions come standard, with MacPherson struts and a stabilizer bar in the front, and a compact rear suspension with an "H" design and a stabilizer bar, designed to help reduce noise and vibration. The Acadia also receives power-assisted rack-and-pinion steering. The SE and SEL ride on 16-inch painted aluminum wheels with all-season tires, while the SLT1 and SLT2 trims get 19-inch machined aluminum wheels. The Denali trim rides on 20-inch, two-tone, chrome-clad wheels, though reviewers differ on whether the large wheels help or hinder the Acadia's ride and handling. In addition, the Denali comes standard with hill-hold assist braking for 2012, which applies brakes for 1.5 seconds when the driver releases the brake pedal on inclines of 5 percent or steeper. Just as the Acadia's exterior design finds a good balance, combining the best elements of an SUV and a sedan, the interior mixes SUV roominess with sedan-like convenience, comfort and quietness. The low-profile dash ensures good visibility out the front, although some testers find fault with rearward visibility. Generally the controls are well laid out and within easy reach of the driver. Textured surfaces and chrome metallic trim lend an upscale feel. Most testers and owners like the cabin's good build quality, although some owners note minor build problems here and there. However, most positive comments about the Acadia's interior focus on the vehicle's class-leading interior space. With all three rows of seats in place, the Acadia can pack in 24.1 cubic feet of cargo. When the third row is folded down, cargo space expands to 68.9 cubic feet, and with the second-row seats folded, it expands to 115.9 cubic feet. That easily beats such competitors as the Toyota Highlander, Honda Pilot and Mazda CX-9. GMC offers the Acadia with two interior configurations. The base SL comes with seating for 8, which includes two front bucket seats, a second-row 60/40-split bench seat and a third-row 60/40-split fold-flat bench seat. All other trims receive second-row captain's chairs with a console between them, providing seating for 7. However, owners can opt for the second-row bench seat at no extra cost. Both second-row configurations include GM's Smart Slide feature, making it easy for third-row passengers to reach their seats. All seats are comfortable, with good support, and provide plenty of room for adults. Even the third row does a good job of accommodating adults for short trips, though they might become cramped over longer periods of time. The SL and SLE trims come with standard cloth-covered seats, while the SLT1 and SLT2 get leather upholstery for the first two rows, as well as heated front seats. The Denali adds perforated leather (available on the SLT2) with heated and cooled front seats. Other standard features for the base SL include air conditioning, cruise control, remote keyless entry, a tilt/telescopic steering wheel and power windows and door locks. Tech features include standard OnStar with turn-by-turn navigation and 6 months of the Directions and Connections plan, and a 6-speaker AM/FM audio system with SiriusXM satellite radio. The SLE adds an 8-way power-adjustable driver's seat, a 2-way power-adjustable passenger seat, a leather-wrapped steering wheel, an auto-dimming rear-view mirror, remote vehicle start and Bluetooth. In addition, rear park assist and a rear-view camera system integrated into the rear-view mirror (or available DVD navigation system) come standard. The SLT1 adds tri-zone automatic climate control, an upgraded instrument cluster with an Enhanced Driver Information Center and a 10-speaker Bose audio system with a USB port, while the SLT2 also gets a 4-way power-adjustable driver's seat, as well as such options as a heads-up display, heated and cooled front seats, and rear audio controls. At the top of the line, the Acadia Denali comes equipped with a number of upscale features, including a leather-wrapped steering wheel with mahogany wood inserts, woodgrain finish on the instrument panel and center stack, a heads-up display, illuminated sills and a dual SkyScape sunroof system with sliding front sunroof and fixed rear section. The Denali also includes extra soundproofing and chrome. However, many of its extra features can be added to the SLT2 trim more affordably, and some owners feel the luxury trim lacks soft-touch materials. The IIHS named the 2012 GMC Acadia a Top Safety Pick and gave it an overall top rating of Good, thanks to its ability to protect passengers during frontal, side-impact, rear and rollover crashes. Similarly, the NHTSA gave the Acadia a safety rating of 5 out of 5 stars, which breaks down to 5 stars for protecting passengers during side-impact crashes and 4 stars for front and rollover crashes. GM's StabiliTrak electronic stability control system with rollover mitigation comes standard on the Acadia, along with 4-wheel antilock disc brakes and a tire pressure monitoring system. In addition, the OnStar system includes such safety features as emergency assistance and stolen vehicle tracking. Six airbags also come standard, including side-curtain airbags for all 3 rows of seats. Owners like the overall balance of the Acadia, finding it not too small but not too big, with the right mix of features, styling and pricing. They say the cabin doesn't quite reach the quality level of some of its competitors, but the Acadia's overall look and feel makes up for it. Owners find the Acadia's smooth ride another plus, along with its good acceleration. In addition, owners find a few too many hard surfaces inside, but like the flexibility and functionality of the interior seats. Some of the controls are hard to get to, owners say, such as the audio system's USB jack, and some storage bins are awkwardly located. Most owners are satisfied with the vehicle's fuel economy, however, finding it standard for the class. A number of owners have noted minor build-quality problems with the Acadia, and some find that it lacks the cargo capacity of a minivan. But overall owners appear to be happy with their purchase of the Acadia. 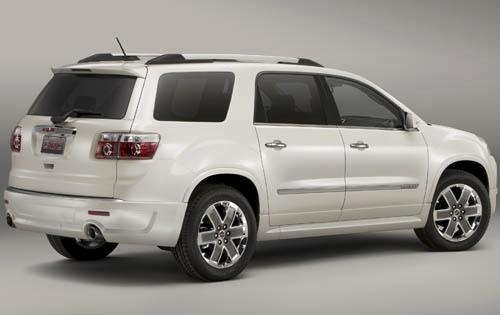 What's your take on the 2012 GMC Acadia? Have you driven a 2012 GMC Acadia? What could it be and how can I fix it? I'm trying to avoid being taken for a financial ride by the dealer.